Standing on the roof of a parking garage in an icy wind is not a pleasant way to start your day. In the cold, looking over the Ford Fiesta ST and Subaru BRZ makes us question why we thought this was a good idea. On the surface, these cars share nothing in common. That doubt will be erased once we’re behind the wheel (and in the heated seats) of these two cars. Despite all their differences, these two cars are remarkably similar. If you want the best bang for your enthusiast buck, there’s no better place to be than on the top of this parking garage. 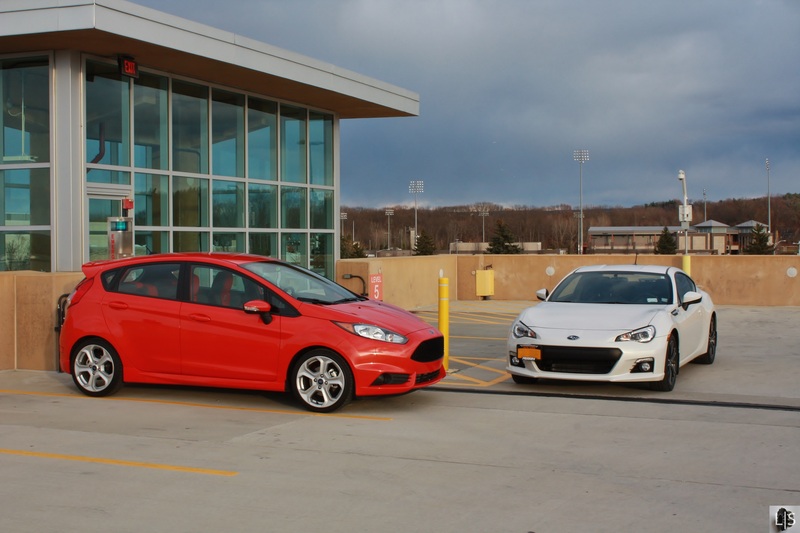 The Fiesta ST and Subaru BRZ seem fundamentally different. The Fiesta is adapted from a mass-market platform. It uses a turbocharger to boost output, runs power to the front wheels, and has five doors. It’s remarkably practical yet highly addictive, all for less than $25,000. The BRZ, on the other hand, resulted from an unlikely partnership. There’s no fancy bolt-ons to increase output, the power goes to the rear wheels, and it only has two doors. Its natural and unadulterated, all for less than $25,000. Two very different cars, a hot hatchback and a sport coupe, sit before us. 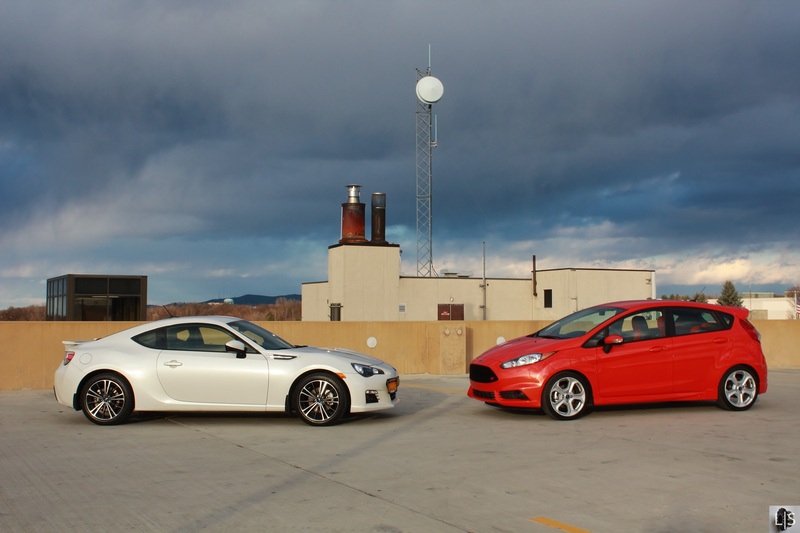 We’ve driven both the Fiesta ST and the Subaru’s twin, the Scion FRS and found them both to be supreme driver’s cars. As pointed out, they’re technically very different. But they occupy the same space and vie for the same market. It’s hard not to compare them, and when you do you find that they’re each unique. Each has qualities that enthusiasts look for and picking a winner largely comes down to a matter of opinions. The Fiesta ST is rather serious looking next to the grinning BRZ. Its lofty greenhouse means it stands 6 inches taller, but that space doesn’t go to waste. The upright seating position, low gear lever, and excellent visibility make it seem much larger than it actually is. Contrast this to the BRZ where you sit much lower to the ground. The smaller windows and higher center console magnify this feeling. The gear level sprouts high from the center console. The throws are similar in length to the Fiesta ST but the positioning makes it feel more race-inspired, almost like a sequential gearbox. Both have excellent seats but the Subaru’s are wider, making them more comfortable. The Subaru also has a superior steering wheel, foreshadowing things to come. As for practicality, the Subaru isn’t even in contention. The Fiesta ST will accommodate four adults comfortably. I’m not sure you can call the padding in the back of the BRZ “seats”. They’re more like shelves with seatbelts. If you ever need to use these cars to transport people, the Fiesta ST is the only real option. As for cargo, the BRZ’s folding seats edge it closer, but the 5 door Fiesta’s rear seats also fold down to open up a larger and taller space. A conundrum arises behind the wheel of these two. The Fiesta ST feels like the faster car. The turbocharged inline-4 is torquier and more responsive with its 197 hp and 214 lb-ft torque. In contrast, the BRZ’s flat-4 makes 200 hp but only 151 lb-ft torque. The difference is in the delivery. The BRZ’s peak power comes at an incredibly high 7000 rpm. The Fiesta ST can only rotate to 6000 rpm, but all 214 lb-ft of torque arrives at 3500 rpm. Amazingly though, the Subaru is actually faster in a straight line through the quarter mile. Chalk it up to less shifting and more predictable power application? We’re not sure. We didn’t encounter many straight lines on our afternoon of testing, though, and since the world isn’t composed of straight lines we should address the matter of handling. The biggest difference between these two cars is how you drive them. The Fiesta ST is peaky thanks to its overboost function, which is a problem when trying to steer. The front wheels are working double-duty. To counter this, you brake hard before the corner, keep the revs up through the apex, and get back on the power once the car is pointing in the right direction. Carry too much speed or get back into the boost too early and you’ll scrub out into understeer. The Fiesta ST is set up brilliantly for this. The brakes have better bite to reign in the flying hatchback and the quicker steering makes changing direction just a flick of the wrist. Unlike the Fiesta ST, the BRZ doesn’t have the torque out of the corners. Being quick in the Subaru requires finesse and control. While the Fiesta is braking, the Subaru carries much more speed into the corner. A slight dab of brake shifts the weight to the nose and helps the car into the apex. The steering is so natural and unassisted that it makes the ST’s feel rubbery in comparison. The BRZ’s lower center of gravity and double wishbone rear suspension keep the car balanced and composed. Get back on the power earlier than the Fiesta ST and you haven’t lost any ground. It isn’t that simple though. You can be overeager and slide out into oversteer if you aren’t careful. There’s a lot of sound and fury in these two cars. The Fiesta ST combines an exhaust rumble with the hissing and blow-off of the turbocharger. The BRZ mixes a coarse engine note with the sound of gears meshing and a hint of exhaust. Both evoke the sounds and feelings of sports cars. But to each their own. 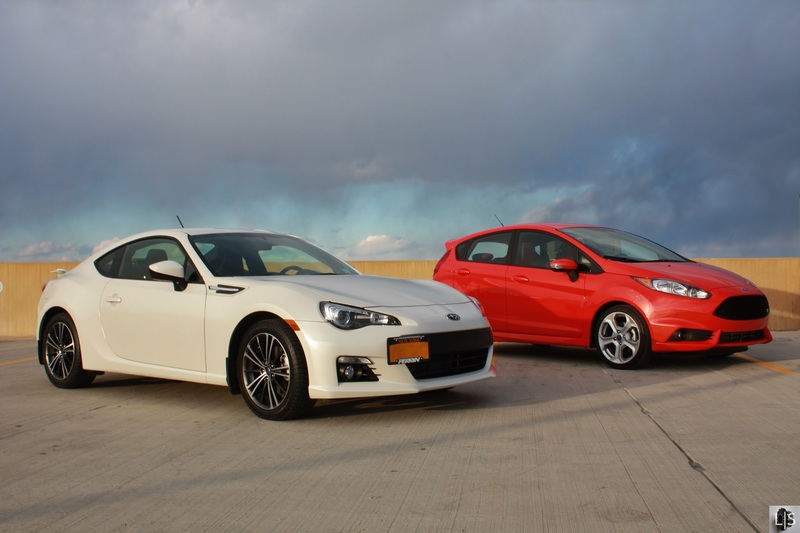 The Ford Fiesta ST and Subaru BRZ couldn’t be more different, and yet they’re made to be so similar. The Fiesta ST is more exciting. Its manic engine, fantastic brakes, and quick steering all factor into that equation. In contrast, the BRZ is far more rewarding to drive. The smooth power delivery, telepathic steering, and unparalleled balance allows every driver to feel like a professional. It makes you a better driver because it teaches you good habits. We can only suggest you go try both. At the end of the day, you’ll know which one you’d rather have. No matter your choice, for $25,000, everyone is a winner. Special thanks to Fred, who was kind enough to let us drive his Subaru BRZ for this comparison.